Equip your workforce with enterprise-grade mobile forms for robust offline data collection. Connect online straight to your own SharePoint and other data systems. The Formotus Pro app is available for iPad, iPhone, Windows devices and Android tablets and phones. You will find sample forms deployed to the free user account. Our customers create and deploy Formotus forms for a wide variety of scenarios: construction forms, building inspections, punch lists, work orders, change orders, service dispatch, material and equipment logs, job safety analysis, risk assessment matrix, daily job reports, job routing, delivery tickets, service requests, security audits, incident reports, merchandising, quality control, healthcare forms, sales forms, and the list goes on. 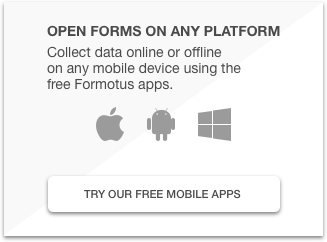 Formotus apps have been optimized at every turn for robust offline use of intelligent mobile forms. Offline productivity is in the DNA of Formotus app design. Mobile users can initiate new forms and work on multiple drafts of multiple forms while offline. No Internet connection is needed to navigate screens, use branch and skip logic, perform calculations, and validate data. Submitted forms queue in an outbox to sync later when online, and queries performed online can be cached for offline access. Formotus does not store your sensitive business data – you do. Unlike other mobile form creation products that require your data to submit to their servers, Formotus data connections transmit directly from your devices to your data systems. This is an important consideration for data security and compliance with HIPAA, FISMA, ISO 27001 and other regulations that may specify where and how your data must be stored. 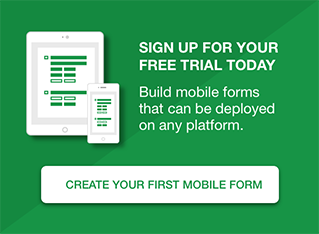 The Formotus service lets you create SharePoint-connected mobile forms using a no-code data connection wizard. With just a few clicks you can configure your app to query or submit from the Formotus Pro app to your own SharePoint list or library. The Formotus service supports any version of SharePoint, on-premise, hosted or online. There is no server-side software to be installed, Formotus apps work with SharePoint in the same way InfoPath does, with no installs or special configuration required: SharePoint 2010, SharePoint 2013, SharePoint 2016 and SharePoint Online in Office 365. Formotus mobile forms can be created from InfoPath form templates so they are indistinguishable from InfoPath forms on SharePoint. Besides all the usual form controls you’d expect – text boxes, dropdown lists, checkboxes, radio buttons and the like – Formotus mobile forms support many custom controls specialized for use with mobile devices. You can capture signatures, pictures, diagrams, barcodes, GPS locations, maps and more.